Mark Johnson is presenting a training for the Ohio DOT LTAP: 2017 Ohio Roundabouts Conference in Hilliard, OH on Friday, Sept. 15th. His training will cover the trending topic “Designing Roundabouts for Multi-Modal Safety.” A tour of Hilliard, OH roundabouts will be included in the one-day conference. 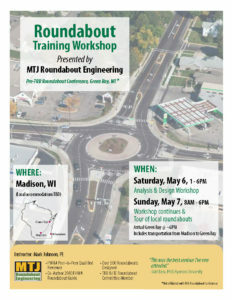 Join us for a roundabout training workshop and tour preceding the TRB Roundabout Conference in Green Bay. Design workshops will be held Saturday, May 6, 1-6pm and lecture and tour will be held Sunday, May 7, 8am-6pm. See the flyer for more information, or email info@mtjengineering.com to register. Mark Johnson, P.E., will be presenting in the TRB Webinar: “The Marriage of Roundabouts and Access Management” on Sept. 26, 2016, 2:00-3:30 PM ET. MTJ will present case studies of high flow multi-lane roundabouts that illustrate how the application of traffic engineering and roundabout design principles can harness the unique operational characteristics of roundabouts to facilitate improved traffic flow, safety, and excellent business access. Mark Johnson, P.E. will be presenting a customized training June 2-3 for the CA Dept. of Transportation (Caltrans). The two-day training will cover the skills necessary to conduct roundabout operational analysis using Rodel Roundabout Analysis Software. Mark Johnson, P.E. will be presenting a two day training for the Educational Program Innovations Center (EPIC). The two-day training course, “Roundabout Planning, Design and Implementation,” will be held in Mississauga, ON on May 2-3. After attending this seminar, you will be able to determine and understand the benefits of roundabouts in our overall roadway planning process, and how to avoid mistakes of the poorly planned, designed and or constructed roundabouts. See more information on the Epic training. Mark Johnson, P.E. will be the instructor for a Roundabout Analysis Workshop on October 25th, 1-5 pm, preceding the ITE Fall Conference. Participants will learn how to use Rodel’s robust and easy-to-use analysis features to inform the design of new roundabouts and assess the effects of modifying existing designs. Mark Johnson, P.E. will present a one-day roundabout analysis workshop on July 28 in Aspen, CO. The workshop will provide attendees with the skills necessary to conduct operational analysis using Rodel software. It is appropriate for traffic engineers, planners, and transportation professionals involved with roadway planning and roundabout implementation. PDH credits are available. The workshop will be held at the Mountain Chalet Aspen. For more information, and registration, click here. Mark Johnson, P.E. will be presenting two trainings for the Educational Program Innovations Center (EPIC). The two-day training course, “Roundabout Planning, Design and Implementation,” will be held in Calgary, Alberta on April 13-14, and in Ottawa, Ontario on April 27-28. After attending this seminar, you will be able to determine and understand the benefits of roundabouts in our overall roadway planning process, and how to avoid mistakes of the poorly planned, designed and or constructed roundabouts. See more information on the Calgary training and the Ottawa training.